Our lives are expressed and enjoyed through the use of our five senses: sight, hearing, smell, touch, and taste. For our kids, sensory play is an essential part of early childhood development. Children grow emotionally and physically through sensory exploration. It sparks joy, stimulates creativity, and fosters cognitive and linguistic development. Children who learn through their senses also learn to appreciate them throughout their lives. These kids grow up in touch with the world around them. How many times do you walk into a shop and have to remind your child, “Don’t touch anything?” Hearing that when you’re a kid can get old fast, especially since kids need to touch, smell, and taste the world around them. While you still need to tell your kid not to touch anything at the store, when you get home, that’s another story! 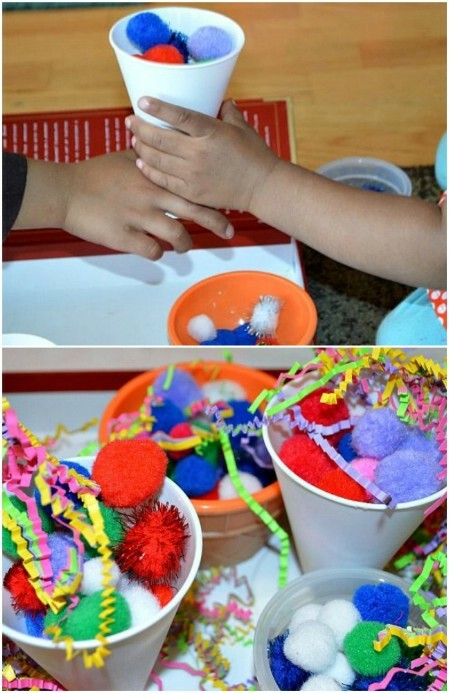 Nothing is more rewarding and engaging for your child than a fun sensory DIY project! Here are some awesome ideas you can do with your child. 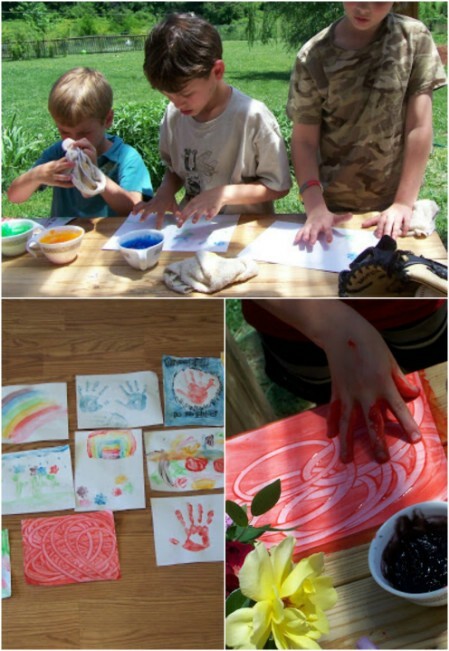 Make easy crayon rubbings to explore texture. 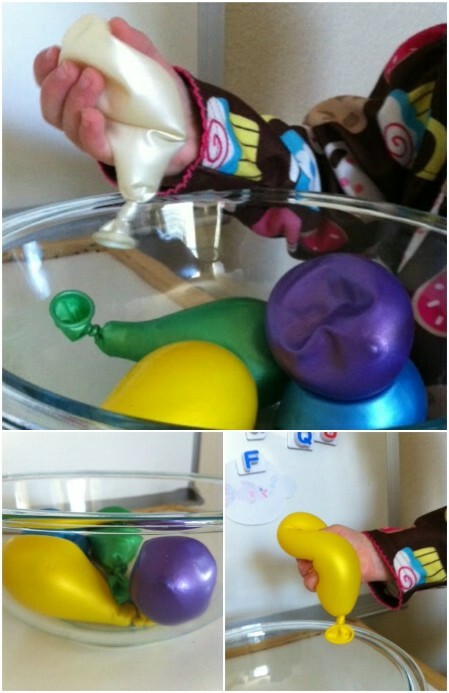 Freeze water beads inside balloons. Play with glowing ice and oil. Teach the difference between wet and dry. Let your child excavate edible dinosaur fossils. Play with scented ice and water. Give your kids colorful cloud dough. Get your cloud dough to fizz. Make fizzy lemon suds eruptions. 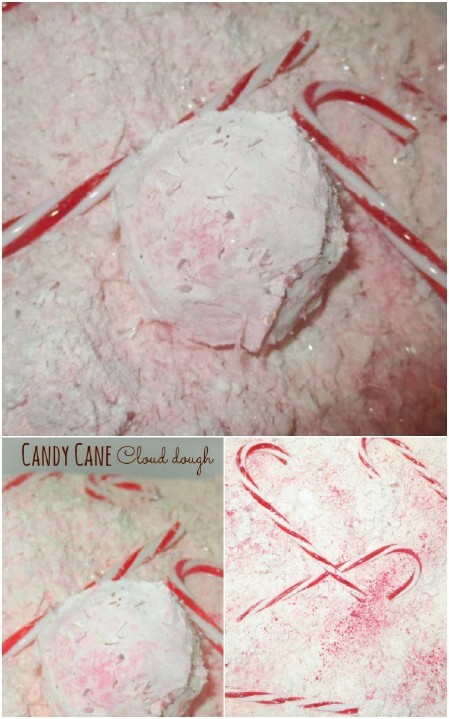 Make candy cane cloud dough for the holidays. Create mosaics on the wall. 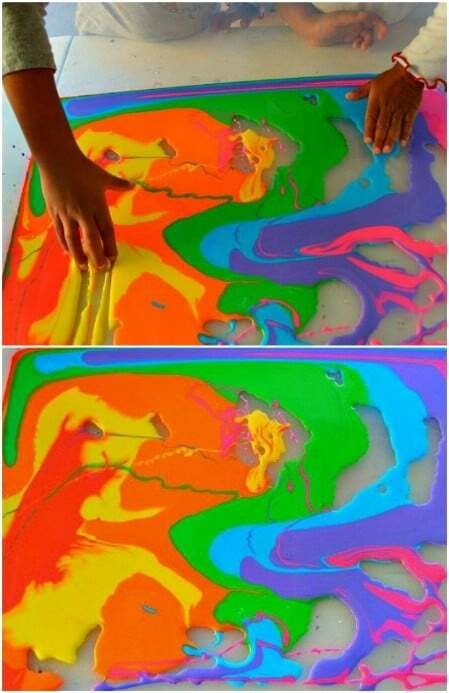 Use Jello paint to teach colors. 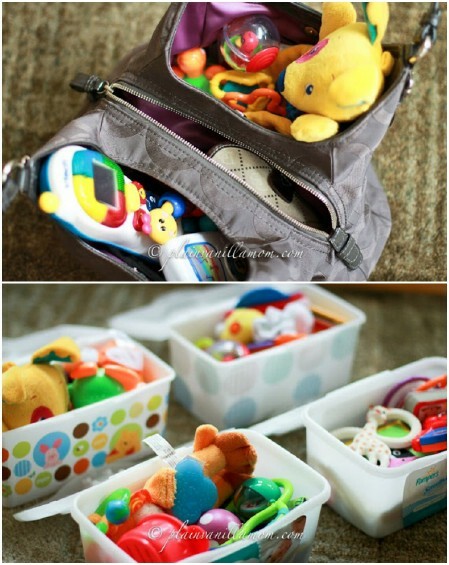 Prepare travel boxes with toys for car trips. Take children on a sound walk. 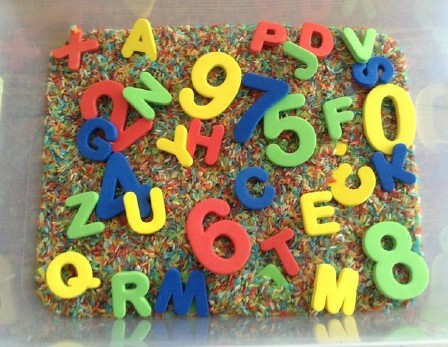 Teach your kids about letters and numbers in a sensory rice bin. Create really cool slime using fiber supplements. Make sundaes out of pom pons. Try painting with Epsom salts. Brass rubbing was a popular method for reproducing metal plaques on paper in the Middle Ages. 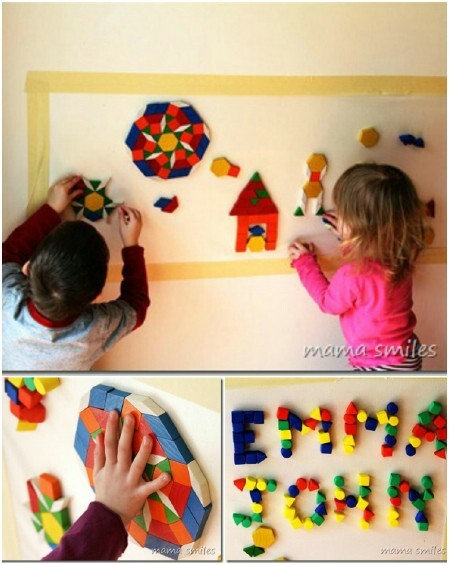 Children can do a similar activity using crayons and paper. You just set the paper on top of any surface with a texture, and you rub over it with a crayon. 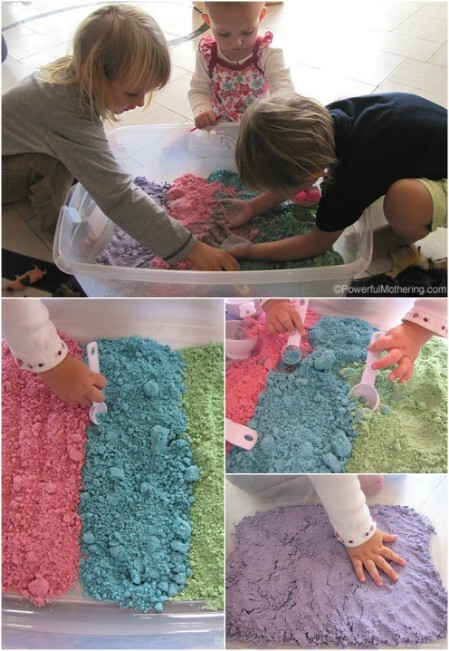 This is a great way for children to wrap their minds around the concept of texture. It also is a fun way of creating “texture snapshots” while you are out and about. 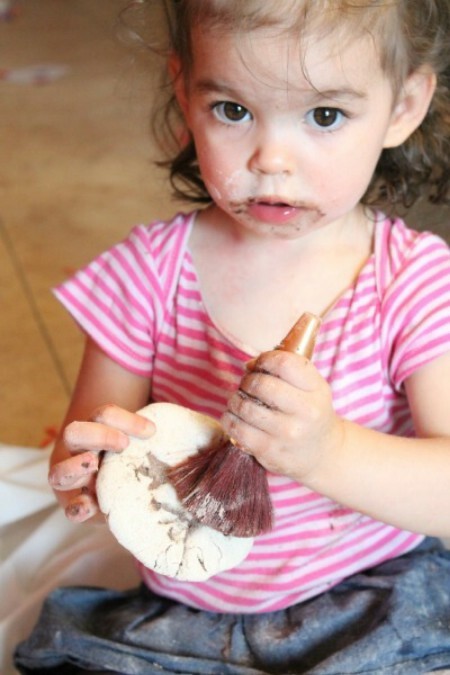 Your kids can collect textures they like and bring them home and save them. Give children the bags and have them try to guess what is inside without looking. They can start by shaking the bag and squishing it and lifting it. Then they can stick their hands inside and feel for the objects. Ask them to use deductive reasoning to come up with a prediction, and then let them check what is inside (you can give them as many guesses as they want). This is a wonderful way to develop cognitive skills, and also a great idea for an activity for a birthday party. Even as a full-grown adult, I find this idea exciting! Who doesn’t love playing with soap foam? And didn’t you always wish that the bubbles came in whimsical colors? 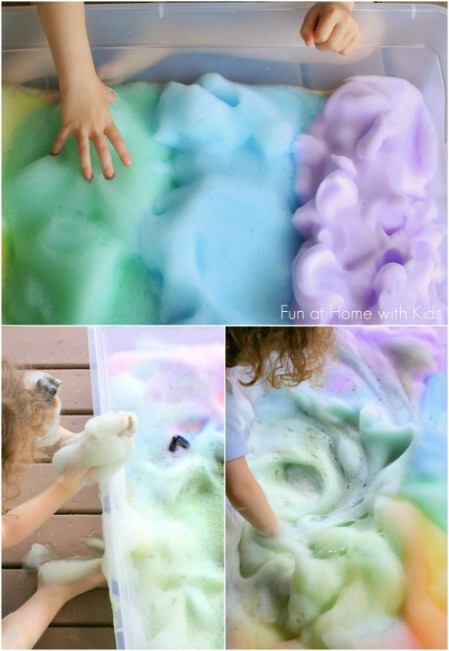 This tutorial will teach you how you can make rainbow soap foam for your kids to play with. For the recipe, you just need Dawn dish soap and food coloring. Alternately, you can use liquid watercolors. If your water is very hard or very soft, you will have to pick up some bottled water as well. Put it in a large container outside somewhere, because your kids are guaranteed to make a mess. Then watch them have fun swirling the colorful bubbles around and building mountains out of them. You know those crystal water beads you can put in your planters? They are very fun from a sensory point of view, which you will quickly find out if you give a handful of them to your kid to play with. There are a lot of cool things you can do with them too. 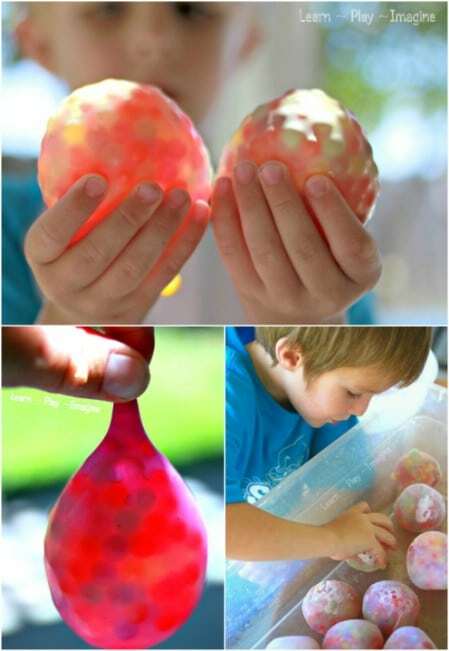 Learn Play Imagine has an interesting tutorial for putting water beads inside balloons and freezing them. There are interesting colors, textures, and sensations to play with throughout this sensory journey. It’s s somewhat random activity, but just looking at the photos is exciting! For kids who love colors and textures, this will be an awesome project. Children who are interested in photography and old enough to use a camera may also have a great time capturing the light and color of the water beads and balloons through a lens. If you want to thrill a kid who wishes they could eat water beads, you can do the next best thing: cook them up some tapioca pearls! Tapioca pearls come in many different colors now, not just white. You can even buy rainbow packages. You just boil them for a few minutes and they are ready to go. If you want to brighten their colors, you can add a splash of food coloring. You can then add the colorful tapioca beads to a plastic container full of water. They will float around and bleed their colors, and kids can swirl them around and play with them. Best of all, they can eat them. The tapiocas keep for two to three days. Store them with a little bit of water to keep them moist, but not too much or the colors will bleed out. 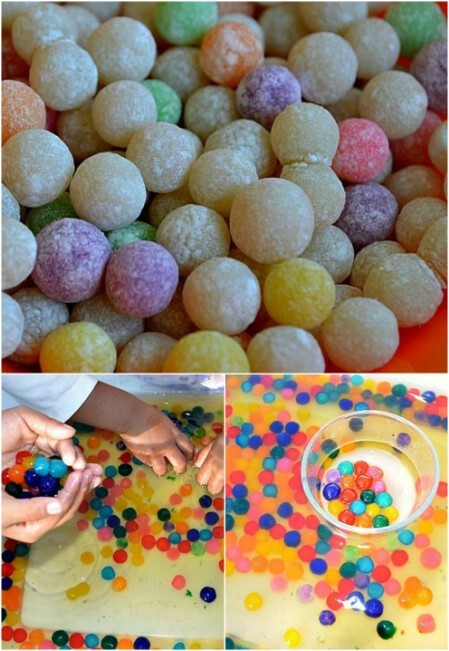 Tapioca beads are a safe, edible alternative to water beads, and they work great for many of the same activities you would do with water beads! Kids love to play around with oil and water, breaking up the bubbles and watching them re-form. This activity takes oil-and-water fun to the next level by introducing an exciting glow-in-the-dark element! 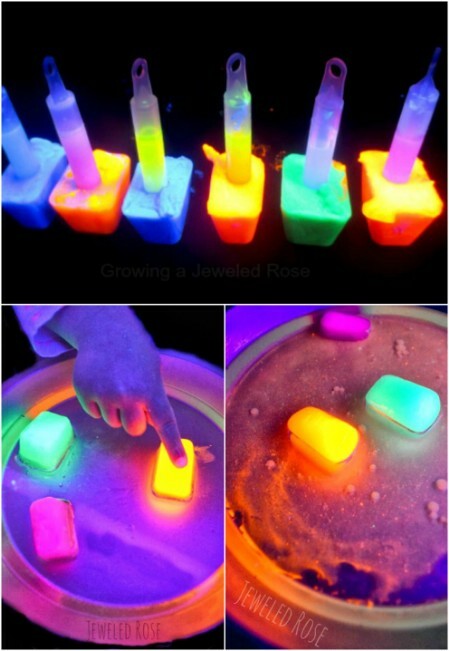 Get an ice tray and mix up some glow in the dark paint and florescent paint with hot water. Pour it in and let it set. Once it is frozen, you will have glowing ice (depending on the type of paint you use, you may need to hold it up to the light to recharge it before you use it). You then fill a pan with oil and float the ice in it. As the ice melts, beads of glowing water will break off and float around inside. Your kids will learn about liquid densities and have an awesome time doing it! This idea is my variation on the Ten Scents of Christmas sensory card idea from A Little Learning for Two. The original activity just involves putting scented items in little sachets attached to cardboard trips and then labeling them appropriately. This can already be amusing for small children, but you can add another dimension by turning it into a guessing game. 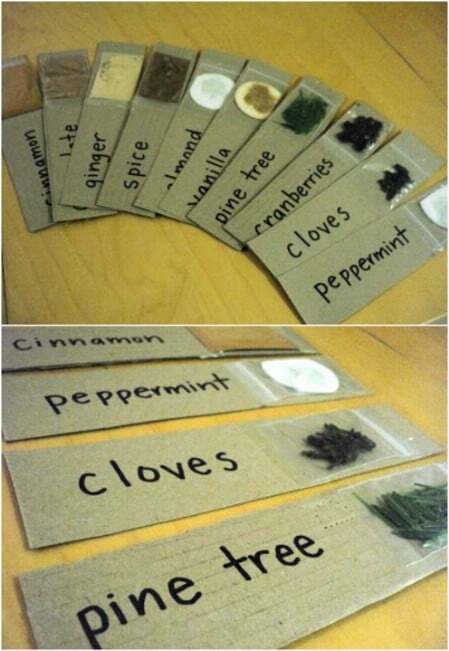 Make the scent cards with your child to teach which scents are which. But then mix up the cards, have your child close her eyes, and hold out each scent. See if she can guess which ones are which by smell alone. 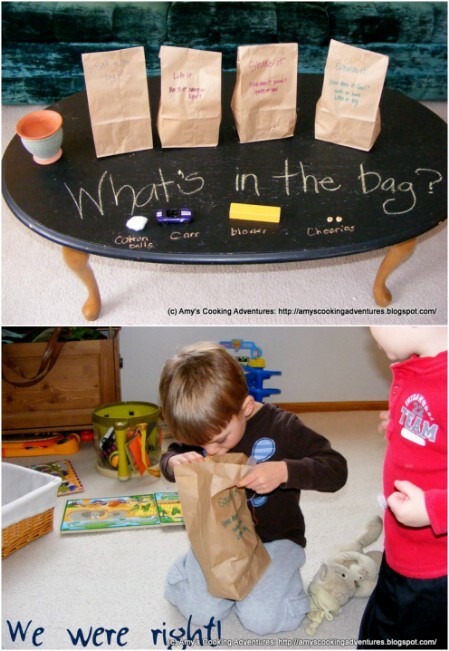 This will help to develop olfactory awareness, and like the “What’s in the Bag?” game, it can be a lot of fun for kids to test their deductive powers! The things you take for granted and have for as long as you can remember you did have to learn once upon a time. When you have toddlers, they are still learning these fundamental basics. One of those basics is the difference between wet or dry. This messy activity is a great way to demonstrate that difference. Just get dry goods like cornmeal, oatmeal, or seeds, and pour them in plastic containers. You can use anything you want for this activity. You might even let your kid pick a few options. Hand your child a big bowl of water and a measuring cup, and let him have at it. Kids will entertain themselves for hours slowly (or quickly) pouring in water and seeing how the texture changes the wetter something gets. Expect a big mess with this one! This sensory activity is so much fun that even older kids will enjoy it (I made it in science class during middle school and loved it). Deriving its name from the classic movie The Absent-Minded Professor, Flubber, also known as oobleck, is an unusual substance that behaves very strangely. Classified as a non-Newtonian fluid, it flows when it is under low stress, but breaks when it is subjected to pressure. So you can drop it from one hand to the other and watch it spill and pool like a liquid, and then you can close your fist around it and crush it like a solid. Kids can make Flubber quickly and easily using a combination of water, borax, and glue. You can add food coloring to make it even more awesome. The stuff is endlessly fun to play with, and a great way to introduce children to physics concepts. This idea comes from Love Play Learn. This is a messy idea, so you probably want to do it outside. You make salt dough and then press plastic dinosaurs against the dough to create an impression. After the salt dough is baked, you have “fossils” which you can hide in the tub with some “dirt.” The dirt here is edible; it’s cake mix, flour and crushed Oreo cookies. I love this idea, but I would take it a step farther. Since the “dirt” is edible, it would be great to make the “fossils” edible too (salt dough is a molding material; even though you bake it, you definitely can’t eat it). One idea might be to substitute sugar cookies cut into dinosaur shapes and hide those in the “dirt’ instead. That way your child can eat the fossils she finds. A very cute idea and a great way to foster the interests of your little paleontologist! This is a very easy activity that takes very little prep time. You just need to mix water and Kool-Aid together and freeze it into ice cubes. The cubes you get are colorful and of course they smell and taste delicious. Kids love the flavored ice cubes on hot days, and have fun tasting them or watching them melt. Edible activities for kids are the best! Unfortunately, a lot of children immediately associate anything brightly colored with food. If your kids love finger painting, but you constantly are having to stop them from trying to eat the paint, now you don’t have to worry about it. 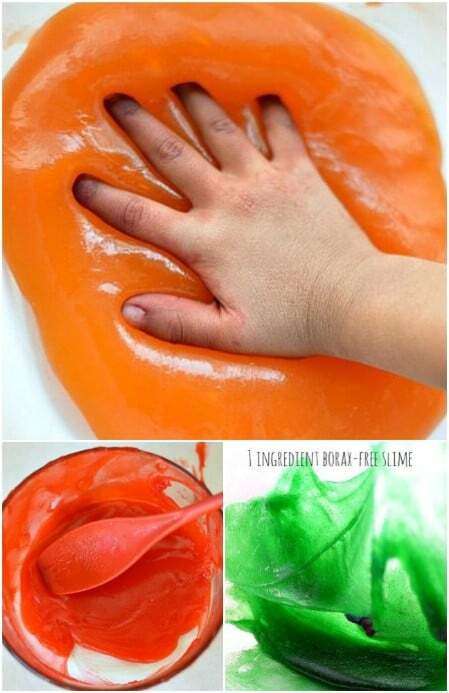 The recipe uses gelatin, water, cornstarch, and food coloring. The paint is perfect for exploring colors and textures. 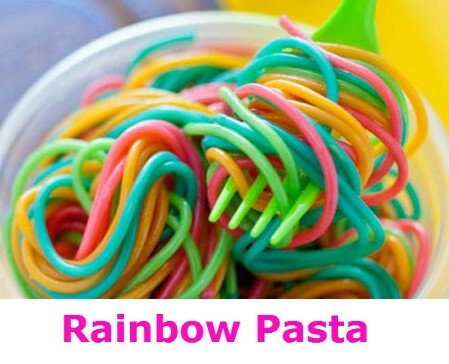 For the kid that loves pasta, nothing will be more exciting than a bowl full of rainbow-colored noodles. Just think how your child reacts to those store-bought noodle packages with the spinach and carrot-flavored noodles in green and orange. Now think how he’ll react to a bowl full of pasta in every shade of the rainbow! Learn how to do it in this video tutorial. 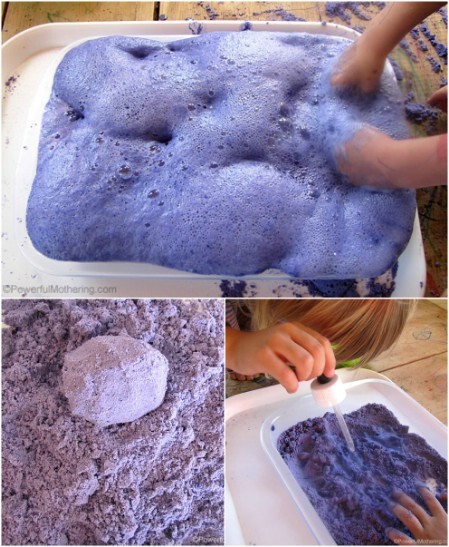 Cloud dough is a favorite sensory activity for small children. It’s a lot like regular dough, except it doesn’t stick to your hands. You can mold it into shapes (like “clouds”), but then it breaks apart again and you can create new shapes. This recipe will teach you how to make cloud dough in soft pastel shades. Cloud dough is already pretty awesome, but wouldn’t it be even cooler if it bubbled and fizzed? This recipe substitutes in some baking soda. The dough behaves the exact same way as regular cloud dough, but since you have a base, you can add in an acid and watch them react. Get an eyedropper and gradually add in vinegar. You get bubbling, foaming reactions. The textures and colors are fun to watch, and this is an easy chemistry lesson for kids. If your kids enjoy the fizzing dough, they will love this activity! This is another science experiment in combining acids and bases, except you are substituting lemon juice for the vinegar (you could just use vinegar if you prefer). 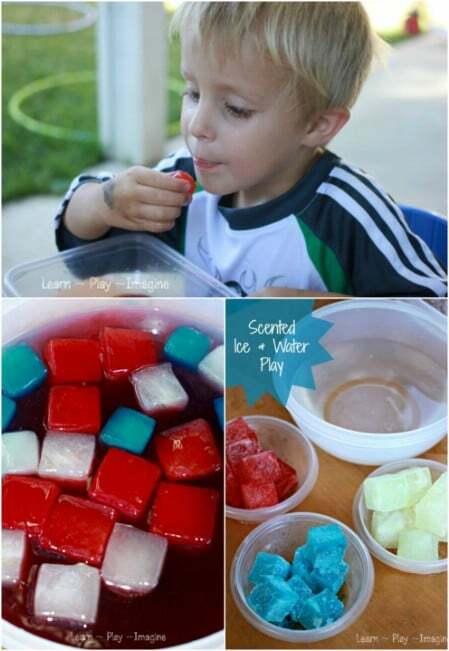 Fill bowls with soapy water and adding food coloring. Your kids are then pouring in lemon juice or citric acid. With the acid combines with the baking soda base, you get an eruption of soft, effervescent foam. The reactions last a long time, and kids can add in more food coloring in different colors to get a dazzling effect. Once your children try this easy science experiment, they will always remember that acids and bases react! Here is one of the easiest ideas in the world, which requires literally no prep time. Just give your kid some Rice Krispies and some water. 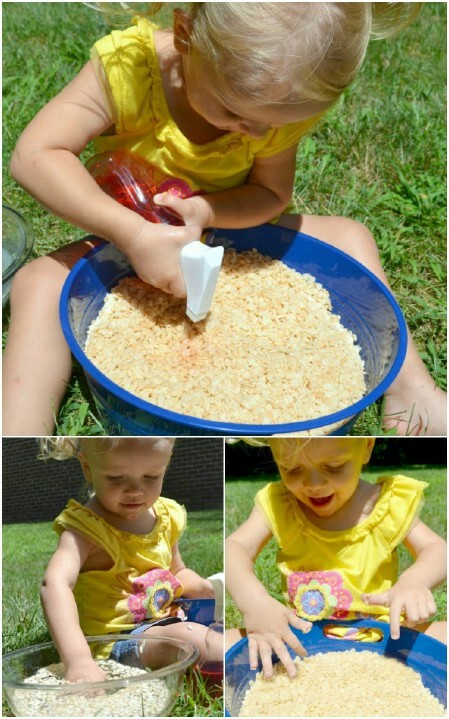 You won’t believe how entertaining popping rice is for a small child (then again, if you’re like me, you still remember how fascinated you were with Rice Krispies as a kid). Hand your child a spray bottle full of colored water or even more popping rice fun. Looking for a Christmas-themed sensory activity? One of the best things about cloud dough is just how easily you can adapt it into different activities. Candy cane cloud dough is just like regular cloud dough, except that you use peppermint extract for an amazing scent, and you can add in red powdered paint to get a spectacular seasonal color. Children can mold the cloud dough into different shapes and create clouds for Santa’s reindeer to fly through. You know those geometric wooden blocks that come in different shapes and colors that kids play with in school? Normally you just create patterns and pictures out of those blocks on the floor. You can use contact paper though to stick them to your wall. That way kids can get the experience of making a wall mosaic. The block stick to the contact paper surprisingly well, and should remain adhered for a couple of days. That gives your children a chance to display their artwork. After the blocks fall off, they can make a new mosaic. This is an endlessly creative project that can really foster a creative young mind! Kids can have a hard time learning colors, but the more senses you can get involved in the learning experience, the easier it is to create strong mental associations that help color concepts to stick. One way you can use your child’s sense of smell to help teach colors is by using Jello paint. Create pictures of fruit and have your child paint them in different colors using Jello-based paint. Since Jello has a strong fruit odor, the scent will stick around for days afterward. Your child can pick up the pictures and smell them. Smell is linked to memory, so your child will have an easier time ingraining color concepts (just watch out, lest you convince your kid that raspberries are actually blue). Do you get into the car with a purse full of toys every day? One great way to free up room in your purse and to keep your kid entertained while you’re running errands or on vacation is to pack some boxes in the car with a variety of toys. Your child can keep his or her senses engaged, and you can focus on your driving. This idea comes from Plain Vanilla Mom. I love that Jen decided to fill the boxes with old toys that tend to be forgotten or neglected at home. It’s a way she can remind her child of just how exciting those toys still are. In the car in a different context, they take on new life. One way you can teach your children the concept of noise and how it relates to objects in the environment is to go on a sound walk. 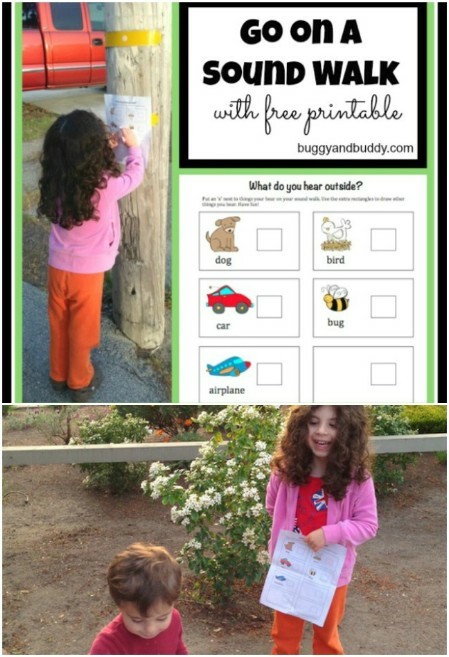 On Buggy and Buddy, you will find a free printable which has pictures of bugs, birds, cars, and so on, along with checkboxes. 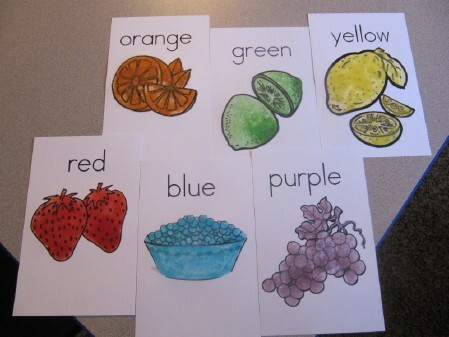 The images provide kids with a visual cue to help them identify corresponding sounds. They can then check the box with each as they go along, and it turns into a game. Here is another fun idea for a bin activity! Get some rice and dye it with Kool-Aid so you get a variety of fun colors and scents. Put the rice in a bin, and then get some foam letters and numbers and add those to the bin too. Kids will have fun playing with these ingredients (the rice alone could be endlessly entertaining), and can also learn about counting and spelling. This fun recipe comes from Kids Play Box. 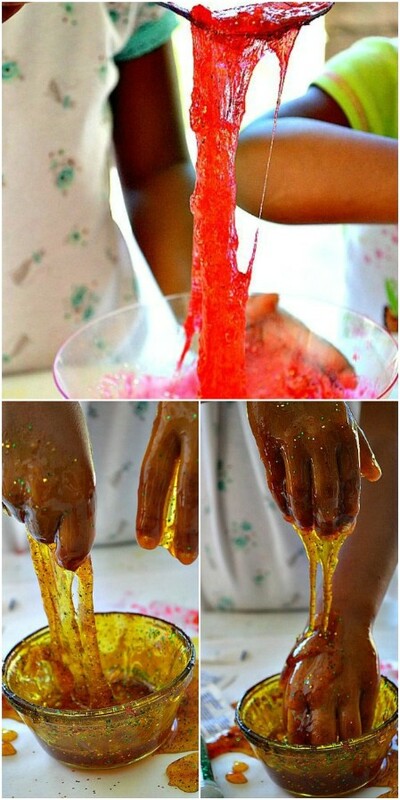 It is made using gelatin and corn syrup, and results in a gooey, sticky substance that you can stretch. You can add different food coloring and scents to different bowls to achieve different results. Adding glitter makes for even more gelatinous fun. 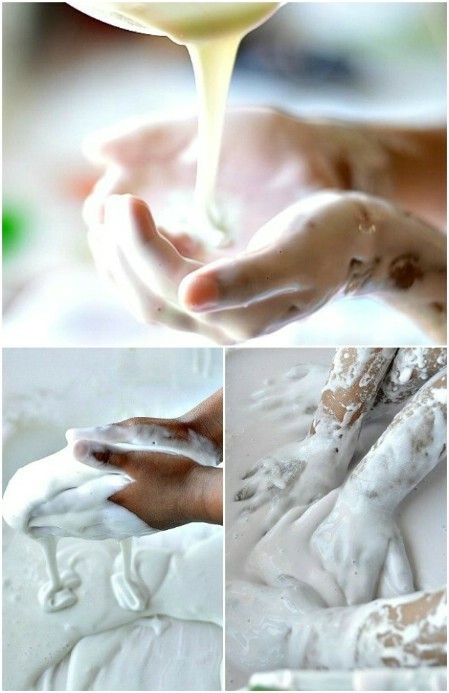 There really are no end of goopy activities for kids to learn about their senses. This one is a recipe for silky-smooth goop that has a really extraordinary texture. It’s another one that uses cornstarch, together with liquid starch. The recipe is similar to the one for Flubber, except you are not going to get a non-Newtonian substance, just a liquid one (you have to use water instead of liquid starch if you want the Flubber). Be ready for a big mess with this one! Who would have thought you could do something so odd using fiber supplements of all things? All you need to create this recipe is water, food coloring, a bowl that is safe for the microwave, and psyllium seed husks. Mix them together and put them in the microwave for five minutes. The substance you get when you pull out the container will amaze you and delight your children. It is a kind of oozing slime which you can pour from container to container. You can stretch it out into a thin film (like bubble gum), and squish it into all kinds of shapes. Simply by adding more fiber and less water, you will get a less-sticky version of the slime which is closer to solid. Let your kids experiment with different recipes. They’ll have a blast! A lot of kids love to play “pretend kitchen.” For the child who loves ice cream, it can be fun to play “pretend ice cream shop.” All you need are some bowls or cones, a bunch of colorful pom pons, and some leftover Easter grass. You could add sparkles or any other kind of embellishment you wanted, though. Let your child come up with the ideas! Just remind her that the sundaes are not edible. Remember the “What’s in the Bag?” activity from before? Another fun variation is “What’s in the Balloon?” Get some items from around the household like coffee beans or cottonballs and fill up some balloons. Hand them to your child and see if he can guess from touch, sound and smell what is inside each balloon. This activity works really well for tactile exploration because it is easy to feel through rubber. 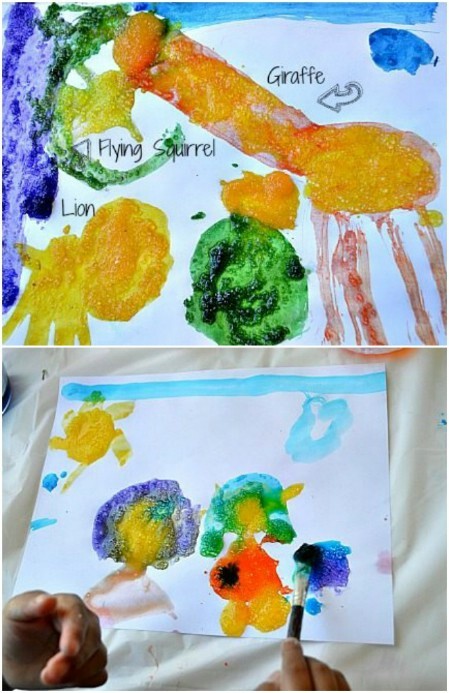 If your child enjoys painting, this is a fun way to bring in a new dimension of texture to a familiar activity. 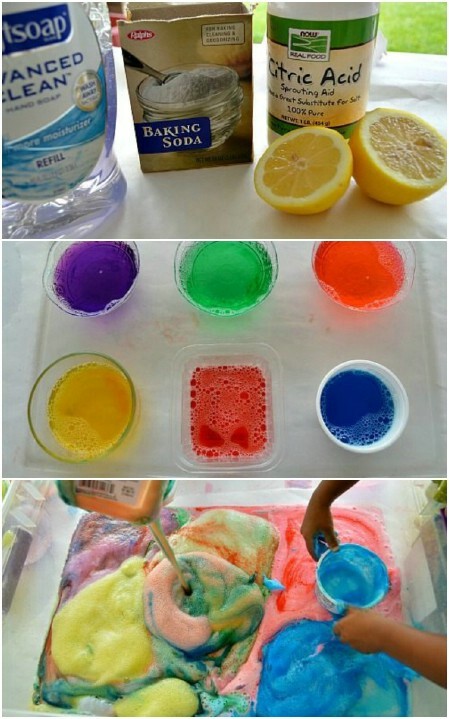 You just mix food coloring and water and add in Epsom salts. The resulting paint has an interesting gritty texture. When it dries, the salts sparkle like little gems. If your child liked the Flubber activity from before, then he will love rainbow oobleck! For this activity, you are just creating Flubber in a range of bright, vivid colors. You then pour them into a plastic bin. Your child can reach down and swirl around the colors and experiment with the amazing non-Newtonian consistency of this incredible substance. This one is guaranteed to keep your child entertained for hours. You can literally make just about anything you want if you really set your mind to it. Case in point, the homemade paper instructions that we found on Kiss the Groom. You begin with recyclable paper like old newspapers and add a few key ingredients. This is a really cute idea that the kids will absolutely love. What’s not to love about making your own colorful paper, after all? You will need to follow the directions precisely and it takes a bit of blending, tearing and other fun tasks. Making your own paper is a great way to spend those cold, rainy days or just any time that you want a DIY project that is fun and easy. 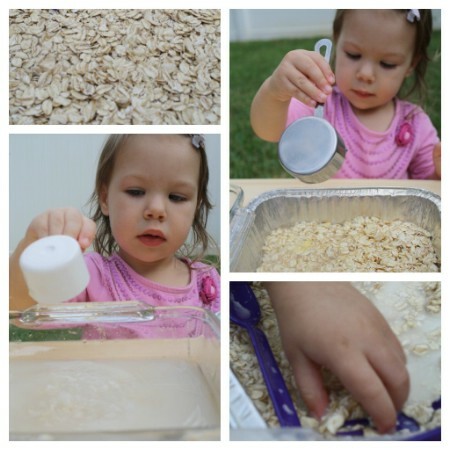 Now you have a ton of great ideas for exciting sensory play! These projects are as educational as they are fun, and will help your child to learn about his or her senses and explore the world in new and creative ways. They are also a great way for you to spend time with your child! These are some great ideas and many of them are so simple to do. Every thing seems to be working okay. Thank you. Great ideas you have shared. Child development is most important. Now there are different toys and child development class provider are there to take care. Bloom Wellbeing is one of them to provide the baby sensory classes to develop their mind easily.